Sundays best for 1884 Wine & Tapas Bar and Hull Kingston Rovers. Picture shows (from left) Hull KR Head of Strength and Conditioning Shane Carney, 1884 Wine & Tapas Chef De Partie Simon Slade and Sous Chef Paul Whitelock, and Hull KR Head Coach Tim Sheens. 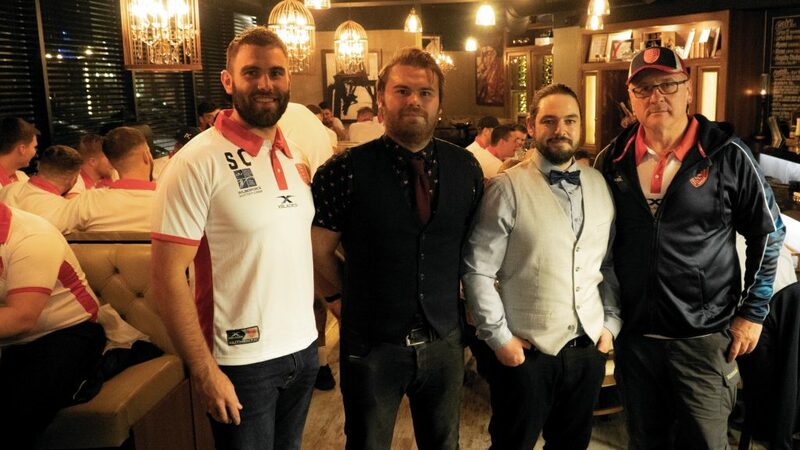 Hull Kingston Rovers’ first team squad were given a taste of things to come when they swapped their Sunday lunch to a Thursday for a visit to one of the city’s top restaurants. The third in a series of videos featuring the Robins saw the players take their seats at 1884 Wine & Tapas Bar to sample the dishes served up by the award-winning restaurant team. Deborah Spicer, Director of 1884 Wine & Tapas Bar, said that as Rovers are scheduled to play more than half their home games on a Sunday during the coming season, it was decided they should be treated to the restaurant’s new take on Sunday lunch. 1884 Wine & Tapas Bar recently revamped its Sunday menu and now presents a selection from its usual tapas range plus meat and vegetable options under the Asado Sundays banner. The players got stuck into delights including a deconstructed fish pie of king prawns and salmon in a cream and shallot sauce, belly pork with a winter slaw and parsnip puree, beetroot and honey ham and a five-bean spiced broth. Next they tackled beef roasted with a garlic and rosemary rub and before the final whistle the players managed to squeeze in desserts including dark chocolate and orange cheesecake, Eton twist and a chef’s combination of salted caramel, chocolate and hazelnut. Deborah said: “Over the last few weeks we’ve welcomed some of the club’s staff to try our tapas menu and then some of the sponsors, who enjoyed one of the buffets that we prepare to order for corporate clients and other special occasions. “Many of the players have been here before and some joined us for the launch of our breakfast menu during the summer, but Asado Sundays are a recent innovation and given that they’ll be working on a lot of Sundays during the coming season we wanted to make sure they didn’t miss out. Head Coach Tim Sheens and Head of Strength and Conditioning Shane Carney were also on hand to make sure the players didn’t overdo it so soon after starting their training for the new campaign, but Tim said he has every faith in his squad. Tim said: “The are a lot of home games on Sundays next season and that’s good news for the fans and the club. They’ve had a very nice Sunday lunch here. The players always let you know if there are any problems and I haven’t heard any complaints. Rovers will kick off the new season with a home game on Friday 1 February against Hull FC. Be the first to comment on "Sundays best for 1884 Wine & Tapas Bar and Hull Kingston Rovers."